This is another popular dish in India. There are many recipes you will find to make this curry. This is a simple recipe and one of my favorites. This curry is usually paired with Baturas or Pooris but goes very well with chapatis (whole wheat Indian flatbread) as well. It also goes well with plain boiled rice. I will have posts up on baturas, pooris and chapatis. Stay tuned. 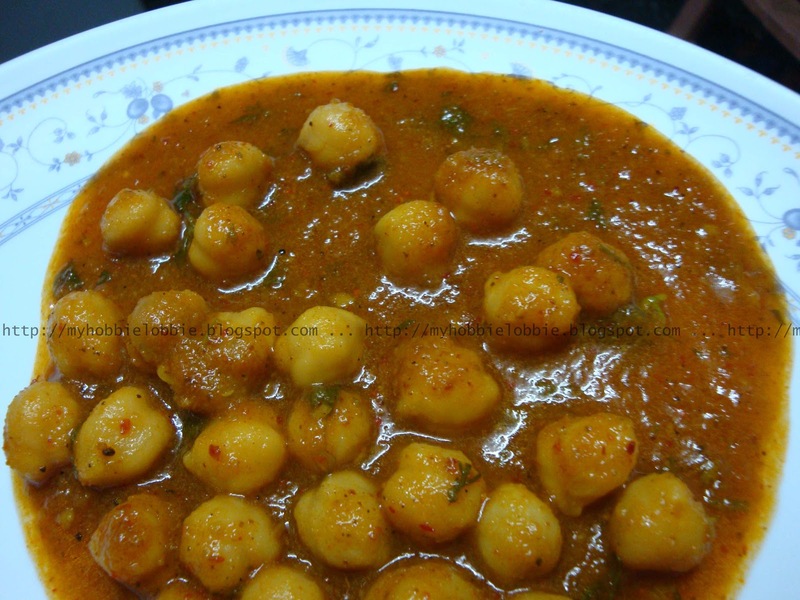 This is a thick gravy, also called a chana masala because of this very reason. Rinse out with fresh water the next day and pressure cook with 2 kashmiri chillies and about 1 tsp. salt. Cook for about 15 minutes after the 1st whistle. If you aren't using a pressure cooker, simply cook till tender. Reserve the stock. In a blender, blitz the onions, chillies, ginger and garlic till you get a smooth paste. Heat the oil in a pot/vessel and tip in the onion paste. Sauté for a few minutes, stirring to make sure it doesn't burn. While this is cooking off, tip the tomatoes in the blender and puree. Keep aside. When the onion paste has thickened, add the turmeric powder, chilly powder and garam masala powder and stir till well mixed with the onion paste. Add the tomato puree, stir well and let it cook off on a medium flame till you see a little of the oil at the sides of the masala paste. It should take a couple of minutes. Add the cooked beans and stir gently. Let it cook in the masala for a couple of minutes. Add some of the water in which the beans were cooked to the pot till you get the desired consistency. Let it thicken a little. Check for salt. Adjust if needed. Sprinkle the chopped coriander leaves and gently mix through. I'm glad I could help Miriam!!! Wow, this must have been one fantastic dish. I just love curries. Its one of my favorites Lisa!